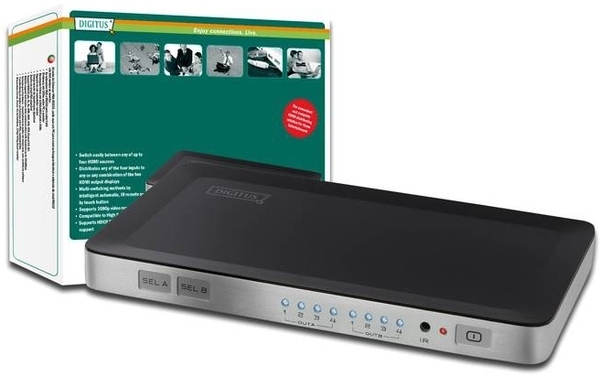 This HDMI Matrix Switch combines the advantages of an ordinary HDMI switch and a HDMI splitter. 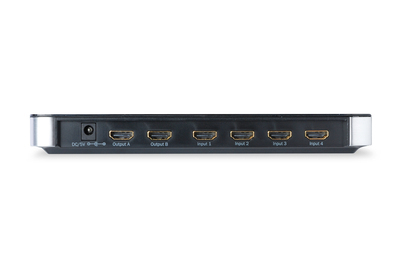 It routes one or two HDMI video signals from four available inputs to one or two selectable HDMI displays. This offers highest versatility for all integrated systems. All inputs are adapted for high definition video sources like HD-DVD, receivers, set-top boxes, game consoles, etc. 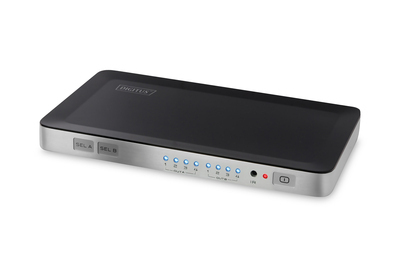 - Switch easily between any of up to four HDMI sources. - Distributes any of the four inputs to any or any combination of the two HDMI output displays. - Multi-switching methods: intelligent automatic, IR remote control or by touch button. - Highest supported video resolution 1080p. - Compatible to High Speed HDMI (1.3b). - Bandwidth: 225MHz/2.25Gbps per channel(6.75Gbps all channel). - Supports 12bit per channel (36bit all channel) deep color. - Supports uncompressed audio such as LPCM. - Supports compressed audio such as DTS Digital, Dolby Digital (including DTS-HD and Dolby True HD). - Dimmensions (DxWxH; Weight): 128x220x25mm; 350g.